﻿ Sport Lisboa e Benfica - the Greatest! This a very pleasant page to write because, as I told you, Sport Lisboa e Benfica, or just Benfica, is my club. One of the greatest clubs in the entire universe. You see, for us football (or soccer) is more than a passion. It's something that really overpasses us. And Benfica is even more special! When Benfica looses a game, half of the country has a bad start in the work week. Know what I mean? "Oh no, Monday... and Benfica lost... I don't wanna go to work!" But when Benfica wins, fortunatelly very often, it's easier to go to work smilling and whistling, specially if it is a big vitory. And I'm not only talking about guys. Women also like football and Benfica (well, at least some of them...). The mascot of Benfica is an eagle - called Victória, wich means victory. When the team plays in Estadio da Luz, its home stadium, the eagle performs a fly from the audience seatings until the sward. It's fantastic! Check it out in the video below. What makes Benfica so special? Well, for a start Benfica has more titles than any other club in Portugal. Next, it has more associates than any other club in the world! It's true, it's even in the World Guiness Records Book. Go and check it out if you don't believe me. More than Manchester United, Real Madrid or Barcelona! It's also a big club in Europe with two Champions League Titles (61/62). Benfica was founded in the year of 1904 by Cosme Damião and another 23 ex-students of Real Casa Pia. wolud have the motto "E Pluribus Unum" (wich means: from many, one) - if you are from USA you should recognize this motto since it is the same as yours, right? Who played for Sport Lisboa e Benfica? Eusébio was probably the best player of all time. And I mean worldwide! He played in the time of Pelé of Brazil and some say that he was even better than Pelé. 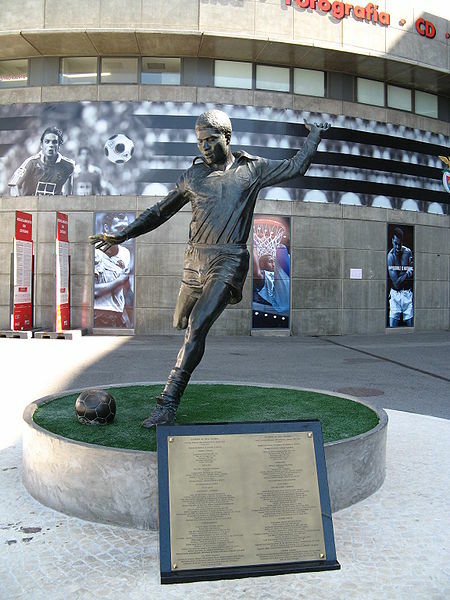 Benfica made a statue for Eusébio at the entrance of its Stadium. But there are other great football players that used this beautifull equipment. Click here to check them out. Is Sport Lisboa e Benfica only about football? Of course not! Benfica has many more sports. Since the early days Benfica added new sports. The first one was Cycling and it was so important that the actual flag still has a bicicle wheel. Two of the most recent famous athlets are Nelsón Évora (Olympic gold medal in triple jump) and Telma Monteiro (World Silver Medal in Judo).